You may be wondering whether you should pay the $99 a year for an individual membership or $149 for a Family Pack subscription for Apple’s MobileMe service, previously called .Mac, which in turn was iTools. The answer on whether you should sign up for a MobileMe account for your Mac is that it depends. Apple lets you use limited versions of certain MobileMe features risk-free for 60 days, so you should try it, at the very least. If you enjoy sharing things like photos, movies, and blogs and travel a lot, you’ll like MobileMe. 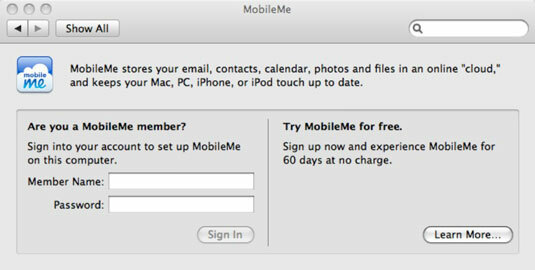 Also, if you have an iPhone or iPod Touch as well as multiple Macs or Windows computers or both, so-called push e-mail, push calendar, and push contacts provide the most compelling reasons to sign up for MobileMe. MobileMe Gallery: A stunning online showcase for pictures and movies from iPhoto and iMovie, respectively. You can also publish albums directly to the Gallery from Apple’s Aperture 2 photo-editing software. Web publishing: A venue for hosting the Web site or blog you’ve created through iWeb. You’ll be issued a Web address that looks something like this: web.me.com/membername. Back to My Mac: Use it to remotely access and control your Leopard-based Mac from another Mac running Leopard. iDisk: A centralized online storage facility you can use to exchange files with others. You can access iDisk through the Finder. Backup: A method of scheduling automatic backups for your Mac. More useful if you’re not exploiting Time Machine in Leopard, or you want to access current copies of your specific directories from other computers. Mail: An ad-free IMAP e-mail account with built-in spam and virus protections. Push e-mail, push contacts, push calendar: Provides updates to your e-mail, contacts, and calendar are pushed across all your devices and computers. And MobileMe works with native OS X applications such as Mail, Address Book, and iCal. iCal calendar publishing: Through MobileMe, you can publish an iCal calendar. Other Mac users can subscribe to your calendar and view it in iCal on their computers. They’ll receive an update as you make changes. You can also synchronize to-do items between iCal and the MobileMe Calendar at me.com. More syncing: OS X users can also sync bookmarks, Dashboard widget preferences, dock items, and System Preferences across the various Macs they own. You have the opportunity to sign up for an account (or trial) when you first turn on your Mac. If you’ve already used your Mac, you can still sign up for the free account by going to System Preferences and clicking the MobileMe icon (found under Internet & Network) or by visiting www.apple.com/mobileme. You’ll see the window shown in here.